Well that's quite a mouthful of initials and adjectives. Canon's supreme monarch of binoculars is the first to have their "L" designation. The "L" suffix in their lineup of lenses for Canon's SLR and video cameras is officially designated as 'luxury' but may as well have evolved to mean 'legendary' - with a price and performance to match the lexicon. While this is not the absolute lightest 10x42 binocular, for many users this will nonetheless be a better choice for fulfilling a life's list of exquisite tools and witnessed species alike. In use, the ability of this unit to stay locked upon your subject is uncanny. Through practice and handling expertise, it is true that experienced users can make good use of a 10x42 roof prism binocular-despite its magnification that's pretty strong for general handholding. But even the steadiest hands cannot match the views rendered by the Canon 10x42 L IS WP, and that means you'll spend more time perusing finer details thanks to the incredibly efficient stabilization. While other similarly-priced binoculars may be brighter, they don't provide higher perceived resolution than these fine lenses with their special field-flattener and ULD lens elements. 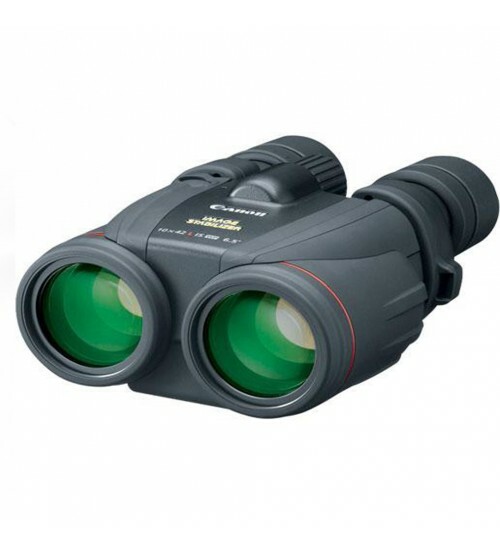 So if you prefer longer observation sessions or have a less than ideal capacity to handhold a binocular, than this is quite likely for you the best price-no-object 10x42 option available today. The Canon 10x42 L IS WP uses conventional 'penlight' AA batteries to operate its stabilization system, and can use either traditional alkaline, NiMh, or lithium versions. It is highly recommended to use lithium whenever conditions are terribly cold, as it greatly increases the battery life at those times. In conditions below 20°F(-7°C), normal alkaline batteries will provide only a tiny fraction of the operating time that you could expect from lithium power. Another nicety Canon bestowed upon the 10x42 L; 52mm filter threadings on the objective lenses, which can be used for polarizers and (best of all) telephoto lens hoods to increase contrast in bright light. 57 - 75 mm / 2.24 - 2.95"